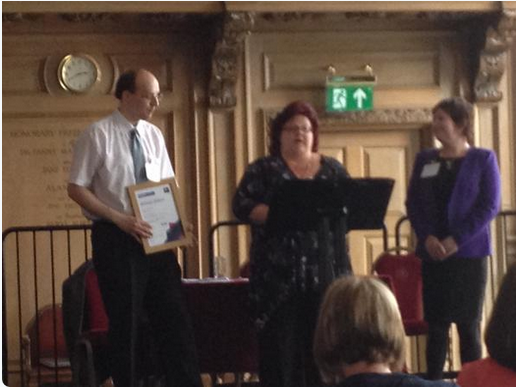 Brilliant award winners were outstanding stars at the Northern England Adult Learners’ Week ceremony in Leeds Civic Hall on Friday 5 June. It was a fitting setting. Built in the 1930s depression, the impressive Civic Hall was a job creation project, providing work and training for adults who would otherwise have been unemployed. Royal National Lifeboat Institution (RNLI), Cullercoats Station – Employer Award, sponsored by One Awards. Jacques Reid – NOCN Learning at Work Award, also sponsored One Awards. You can read more about the award winners here. It was a privilege to act as Master / Mistress of Ceremonies for the event. We heard about partnerships, supportive networks and collaboration throughout a day of passion, pride & powerful stories. People described starting points for their own learning or for their students’ journeys – often talking about isolation, lack of confidence, low levels of qualifications and difficult personal circumstances. They have made undreamed-of progress on their learning journeys. The inspiring success stories and clear evidence of significant returns on investment in adult education came a day after the Chancellor announced the prospect of even more cuts for the FE sector. People spoke of their fears and frustration about short-sighted funding cuts, especially in light of the “Northern Powerhouse” concept which would depend on high calibre talents and skills. Cutting off the supply instead of investing in adult learning and further education is illogical if we are trying to improve prosperity and lessen inequality. Tom Stannard of NIACE captured the shared enthusiasm for adult learning in this short video clip. Following the theme of investment, there was plenty of evidence that the learning bug is infectious, with successful students talking about using their own growing expertise to ‘give something back’ by acting as teachers and mentors, supporting others to follow their examples. Presentations by the WEA’s “Inclusion in Rugby” project and the “Bridges to Learning” project, run in partnership by Unison, the Open University and the WEA showed the impact and reach of adult learning in very different settings. Both projects had featured in previous Adult Learners’ Weeks, showing that progress goes on after award ceremonies. They are not the end of people’s learning and development. Flanked by ex-Sports Minister, Gerry Sutcliffe, WEA tutor Mark Goodwin and members of the Bumble Bee Barbarians mixed ability rugby team described the team’s incredible story. Anthony Brooke, who was born with cerebral palsy, was a student in one of Mark’s assertiveness courses. Anthony’s ambition was to play full contact rugby. What followed, including the formation of the Bumble Bees team, has been magical. Mark and the Bumbles worked with Jane Bilton, a WEA Organiser, and were able to set up a class for players with Learning Disabilities – the WEA Inclusion in Rugby Group – aiming to promote disability awareness, social inclusion and equality through rugby. The players created a promotional training package and presentation designed to encourage the creation of new inclusive teams and the expansion of mixed ability rugby. They have become unstoppable, with prestigious individual and group awards for Anthony, Mark and the Bumbles, television appearances and the formation of IMAS, an International Mixed Ability Sports community interest company. They are now central to organising the first Mixed Ability Rugby World Tournament in Bradford and are learning how to raise funds. You can find out more (and donate) here. Moving onto another project with far-reaching results, Anne Hansen and Unison Union Learning Reps (ULRs) showed the “Bridges to Learning” initiative’s impact. The partnership project involves volunteers who take learning into workplaces. It encourages workers in the health, social care and education sectors to develop in their jobs through taking part in learning and training. Staff and volunteers work with employers to create recognised progression routes for individuals and teams to move forward. The ULRs spoke enthusiastically about their own learning and how they encourage others to further their education. The statistics they shared were striking, showing the project’s reach and effects. John Barker and the event organisers from the WEA’s Yorkshire and Humber region showed how a successful celebration can be staged with limited resources and endless patience. The nominated learners, tutors, employers and projects showed the power and value of lifelong learning. It is precious and potent. Everyone who was present believes that we must stand up for adult learning. The stories and statistics of success are compelling.